But the EU is already actively pursuing an anti-fake news campaign, specifically directed at Kremlin disinformation. It started a website called ‘EU vs Disinfo’, where it selects articles the EU qualifies as fake news and ‘pro-Kremlin disinformation’. It is a type of naming and shaming strategy, where the EU links to the media which in its eyes are ‘disinforming outlets’. On EU vs Disinfo, the EU accused three Dutch media of spreading fake news. However, these accusations were all false, and the EU had to rectify its accusations. These media were accused of ‘giving no supporting facts’, ‘repeating disinformation’ and ‘uncritical reporting’. Already at first glance, these accusations turned out to be nonsensical. The article which allegedly gave ‘no supporting facts’ in fact contained a plethora of links to authoritative sources to back up its assertions. Another article was merely a report of a political discussion in which several people were cited who criticized Ukraine. However, the EU claimed this was fake news as the article was allegedly ‘aimed only at worsening the image of Ukraine’. None of the articles were actually fake news. The common problem with all articles for the EU appeared simply to be that they all contained some form of legitimate criticism of Ukraine. 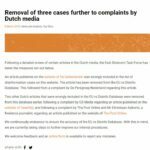 The Dutch media therefore summoned the EU to cease publication of the false accusations and rectify them, threatening litigation. The EU then partly removed the accusations towards two of the media, but it refused to publish a rectification and maintained the accusations were correct in the third case.The Dutch media therefore commenced court proceedings against the EU in which these and other issues were raised (the writ of summons in the court case can be read here). It was only after the Dutch media commenced court proceedings against the EU, and just a few days before the court hearing in the case, that the EU fully admitted all its accusations were wrong, removed them from the internet and placed a prominent rectification on the EU vs Disinfo website. The EU was criticized heavily for its false accusations and Dutch Parliament passed a motion to abolish EU vs Disinfo entirely: the minister of Internal Affairs is tasked with carrying out this motion. In the recently published Communication the EU is now nonetheless proposing to build on its discredited EU vs Disinfo campaign in its fight against fake news. It proposes that the EU’s ‘strategic communications’, of which EU vs Disinfo is part and parcel, should be ‘strengthened’ and ‘developed’. Even after the abovementioned court case the EU still appears not to see that these measures will be seriously problematic in light of the freedom of speech. They will have a chilling effect on the dissemination of viewpoints that are not to the liking of the EU. And perhaps most importantly, the EU is trying to be the arbiter of truth, which is unacceptable in a democratic society. In its legal defense in the Netherlands, the EU did not address this point and in the Communication the freedom of speech is not even mentioned as a concern in relation to EU vs Disinfo and strategic communications. This is worrying, especially as it is the EU itself which has codified the fundamental right of freedom of speech and information and should defend this fundamental right. To illustrate how serious the problem is, one could for example take a look at one particular publication which was flagged as ‘fake news’ by the EU. In 2016 the American politician Ron Paul wrote an opinion piece to the effect that the fight against fake news is a war against free speech, and can lead to censorship. This publication draws the ire of the EU, which promptly labeled the opinion itself as ‘fake news’ – so Paul’s opinion is incorrect according to the EU. So: according to the EU stating that the fight against fake news can be problematic in light of the freedom of speech is ‘fake news’ and qualifies as ‘spreading of disinformation’. The irony of these accusations seems to be completely lost on the EU. So why does the EU flag these harmless opinions and critical reports on Ukraine as fake news? Well, they’re pretty honest. The aim of the EU vs Disinfo campaign isn’t really combating the spreading of disinformation. It’s an instrument to realize the EU’s common foreign and security policy aims in the so-called ‘Eastern European Neighborhood’ (the non-EU countries east of the EU). In the action plan underlying the campaign the EU notes: “Strategic communication is an important tool in furthering the EU’s overall policy objectives”, and also states that a fundamental tenet of the EU vs Disinfo campaign is to spread “positive and effective messages regarding EU policies towards the region”. The aim of the EU’s anti-fake news campaign is therefore not combating the spread of incorrect information. The aim is to spread pro-EU ‘strategic communications’ (also known as propaganda). That means the EU vs Disinfo campaign is, like any propaganda campaign, primarily directed at serving the EU’s interests. So the aim of the EU’s anti-fake news campaign isn’t really to fight fake news. The EU seems to make use of the fear for fake news to spread pro-EU ‘strategic communications’. In other words: propaganda. The EU’s initiatives in fighting fake news should therefore be regarded with a healthy dose of skepticism. The authors of this article (Jens van den Brink and Emiel Jurjens) are both attorneys-at-law at Kennedy Van der Laan in Amsterdam, and have acted on behalf of the Dutch media in the court case against the EU discussed in this article.